KOHZU also offers a unique, broad line of precision swivel or tip/tilt stages. These high stiffness, long life rotation stages have a variety of different points of rotation allowing for stacked axes to rotate about a common point in space. These stages are offered as motor driven or manual. Motor driven stages can be upgraded with rotary or linear encoders, gearboxes along with cleanroom grease. KOHZU’s goniometer stages (a.k.a. swivel stages, tip/tilt stages) are high-rigidity, semi-arched rotation stages that offer the ability to easily stack with X, Y, Z and R stages to make compact 4, 5 and 6 axes for precision motion applications. 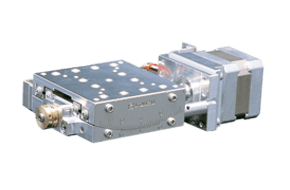 Multi axis motion systems using goniometer positioning stages are heavily used in optical alignment applications. Answers to the questions we get most often. Exceptional Sales & Customer Service for KOHZU and FIAMA Precision Stages, Displacement Monitors, and Automation Components.